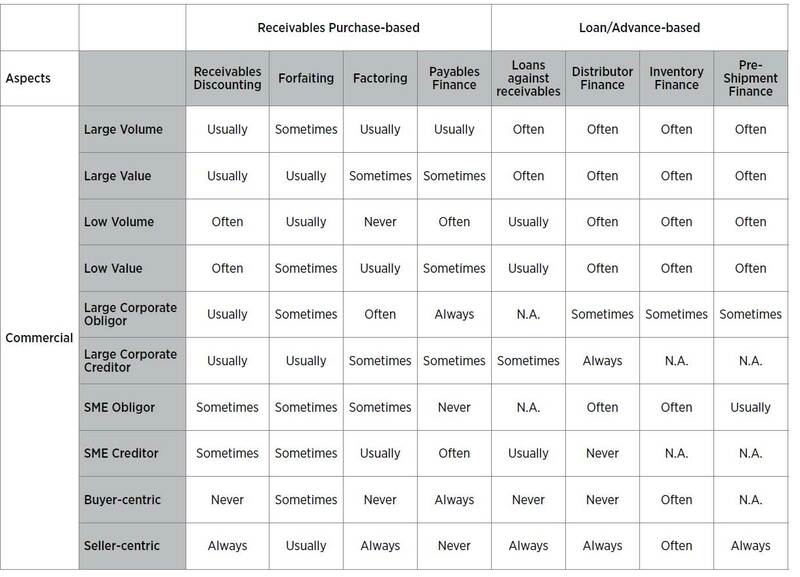 The following table is provided as a simplified summary of the SCF techniques to provide a quick and convenient overview. It categorises all techniques described in this document against characteristics the reader may find useful when judging which technique may be most appropriate for the respective individual need. Being an enabling framework for various financing forms rather than a financing technique in itself, the BPO is not listed in this overview. Percentages may vary by financial provider and market practice. The categorisation of the techniques in the table is based on best estimates at the time of publication. The underlying reason for such classification may result from commercial, legal, operational, technical or any other circumstances that are not further elaborated in this section, as its primary intention is to condense the detailed information provided in the preceding section. The table should hence be used as a primary indicator, providing a first orientation and direction to the reader. In order to validate whether a specific SCF technique applies to a respective need, it is recommended to read the detailed technique description or further material quoted in this document and thereafter to seek expert advice as appropriate. Copyright . © BAFT, EBA, FCI, ICC and ITFA. All rights reserved. BAFT, EBA, FCI, ICC and ITFA hold all copyright and other intellectual property rights in this collective work. Excerpts may be reproduced for non-commercial purposes, with an acknowledgement of the sources.